Please take a moment to see the changes and understand the new ways you can optimize your account with Adalysis. Adalysis has many pre-built filters you can access throughout the tool. You can now create and save your own custom filters for quick access when you return to a screen. In addition, you can use these filters to create custom alerts that will show on the alert dashboard. This flexibility should allow you to customize the views you want to see across the dashboard and create the alerts you need to take action upon based upon how you manage accounts. This video will walk you through how to create custom filters and alerts. 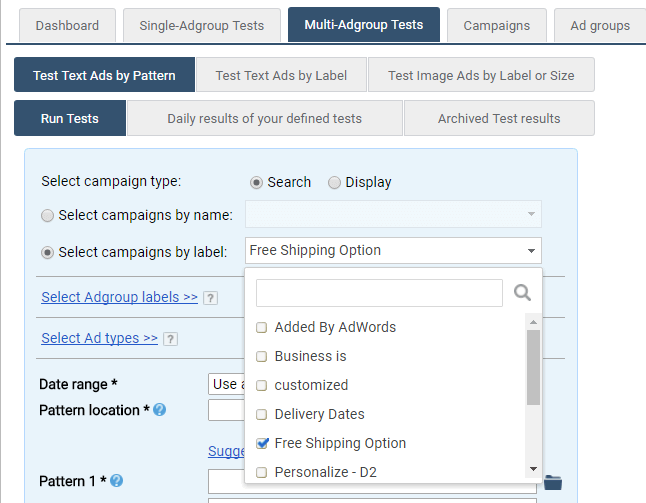 When you are multi-ad group testing, you often want to use multiple campaigns such as all your brands, products, etc. You can now choose a campaign label and we’ll include all the campaigns with that label in the test. We include all campaigns with the label but don’t show the label so that, if the labels change, your test will still run. Think of it as the ultimate shortcut for quickly choosing groups of campaigns. Bulk ad creation is very useful, however, sometimes you need to send the entire list to your client, legal, or brand team for approval before you can make the changes. When you use the preview for the bulk ad creation tools, you can now download the previews without creating any ads to save or share with others. We’ve been monitoring your domains and checking all your links for some time now. These checks now include ad extensions with links such as sitelinks. If you have a broken sitelink, it will show in your dashbaord alerts and on the broken URL page. If you have a search term that hits your criteria to add as a new keyword, we show an alert that you should add this term as an exact match variation of that term. We will now exclude any search terms from suggestions that have an exact match version of that keyword in the same campaign.